Even in history’s darkest, most brutal wars, there are times when people find a way to place love and compassion above hatred and unite together in a shared humanity. 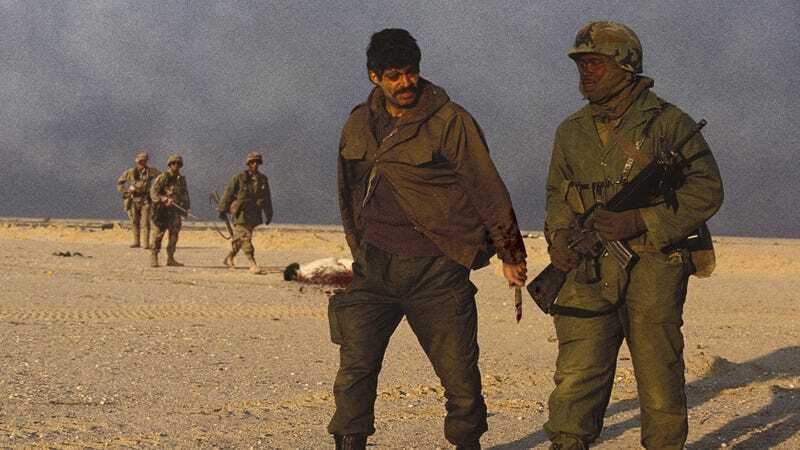 One recently uncovered photograph from the Gulf War that’s been taking the internet by storm is an amazingly hopeful example of just that: The photo shows U.S. and Iraqi soldiers banding together to disembowel an Elvis impersonator. Wow. What an absolutely breathtaking display of brotherhood transcending conflict. The picture, taken by photojournalist Kenneth Parker, only becomes more incredible once you know the story behind it. It was at the peak Operation Desert Storm that the Elvis impersonator in the photo sauntered onto the battlefield in the town of Al Bassaya to make disparaging remarks about both President George H.W. Bush and Saddam Hussein, mumbling, “President Books and Samantha Hussein ain’t nothin’ but momma June bugs in a tin-roof rain gutter, mhm, huh-ya, and that’s coming from the King, honey.” That’s when both American and Iraqi soldiers temporarily stopped fighting one another and joined together to hold the Elvis look-a-like on the ground, rip open his bejeweled jumpsuit, and gut him alive, yanking out his intestines and holding them in front of his trembling gold-rimmed sunglasses as he screamed “Lord have mercy on the King!” still in-character. Several U.S. soldiers present at the gutting depicted in the photo reportedly even offered Iraqi troops water to wipe the Elvis impersonator’s entrails off their uniforms, a gesture that’s as beautiful as it is miraculous when you consider that their units were engaged in a vicious tank battle just an hour prior. You’d be hard-pressed to find a more perfect example of man’s inherently good nature than the sight of an Iraqi soldier handing the Elvis impersonator’s exposed, still-beating heart to an American soldier, generously offering his enemy the honor of stuffing it inside the Elvis impersonator’s mouth as the life faded from his eyes and his body slowly stopped imitating the soul-singer’s signature shimmies and hip thrusts until it was completely still. This photo is definitely the most heartwarming image you’re going to see all day. In a time when America remains engaged in several unending wars and it seems like violent conflict will never end, it’s images like these that offer a ray of hope that the world can finally find peace. This is the kind of history humanity should be learning from!